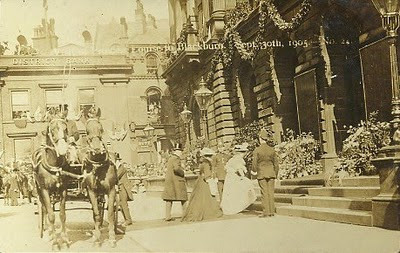 This image is from Sept 30th 1905 (as it says on the card) and shows Princess Louise entering the Town Hall. She was visiting Blackburn for the unveiling of her mother's (Queen Victoria) statue on the Boulevard. The Lewis Textile Museum, was at this time, still the Bute Cafe / Tea Rooms, you can just about make out the word Bute in the window. Also, note the people hanging out of the upper windows. There's even a few on the roof of the District Bank. I thought that it was a Photo of you arriving to pay your Council Tax Colin. The Lewis Textile Museum was one my favourite places to visit a a Lad, I used to love looking at the exhibits they had in there. The last I heard was that the Council had closed it in order to save a paltry £20000 a year, which in the overall budget of the town seems to be a pathetic excuse in my opinion. During my time as an employee of the Council I had the privilege of having free access to the Town Hall, and on the 2nd Floor there still exists the original Gents Toilets from when it was built, which the general public (Males) have probably never seen, and they really are a masterpiece of Victorian Sanitary fittings. As I no longer have this privilage of admission I will try and get in touch with one of my old colleagues who still work ther and see if he will let me get some Photo's of them. Apart from the Toilets you woudn't believe the treasures of Blackburn of old which are held in there. One of my ex colleagues at the college was Head Porter at the museum for 19 years, he had access to the Town Hall archives from time to time. He sometimes had to go through thousands of documents and files and decide which should be kept and which trashed. He said much of what was trashed was sometimes worth keeping, but due to lack of storage space, it was impossible. Some were obviously kept for the museum and the reference library, because of their historical significance. Listening to the radio just yesterday, one of the curators at the Harris Museum in Preston said they had 50,000 items in her department (Local Studies) alone. I'm sure Blackburn is the same,so you can understand why they can't hold on to everything. I'd like to see the photos if you get them John.